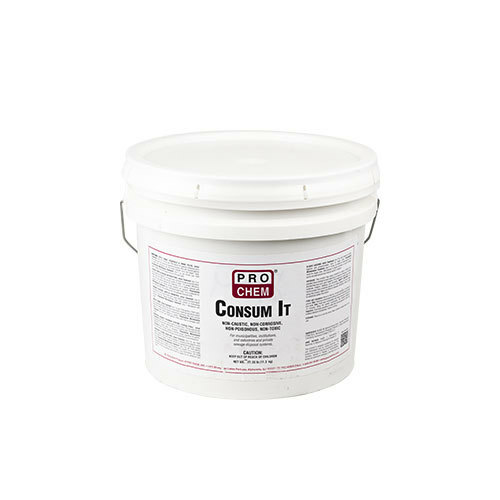 Consum It | Pro Chem, Inc.
CONSUM IT contains a synergistic blend of engineered bacterial stains for effective removal of various organic soils. It is fortified with free enzymes and detergents. 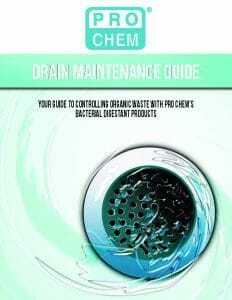 This product may be used in septic tanks, cesspools, drain fields, grease traps and for other sewage treatment applications where the enzymes will remain in an activated condition for at least a week. It provides a very quick, thorough action for drains and areas where only a minimum of time is available. For Septic Tanks, Cesspools, and Drain Fields: Initial Treatment: Use 12 oz. (3/4 lb) per 1000 gallons of capacity, repeating every other week until the system is operating properly. Mix with several gallons of water and introduce into the toilet farthest from the septic tank. Preventative Maintenance Treatment: Use 3 oz. per month, per 1000 gallon capacity. Mix with water and flush through toilet. See label for complete directions for other applications.